Before I begin, I would like to take this opportunity to remember our martyrs, Veer Naris and veterans for their service and sacrifices, as we rededicate ourselves to the service of the Nation. The Navy Day is celebrated to commemorate the success of Operation Trident, which saw Missile boats of the Indian Navy's Killer squadron, undertaking a blazing attack on Karachi harbour of 04 December 1971. 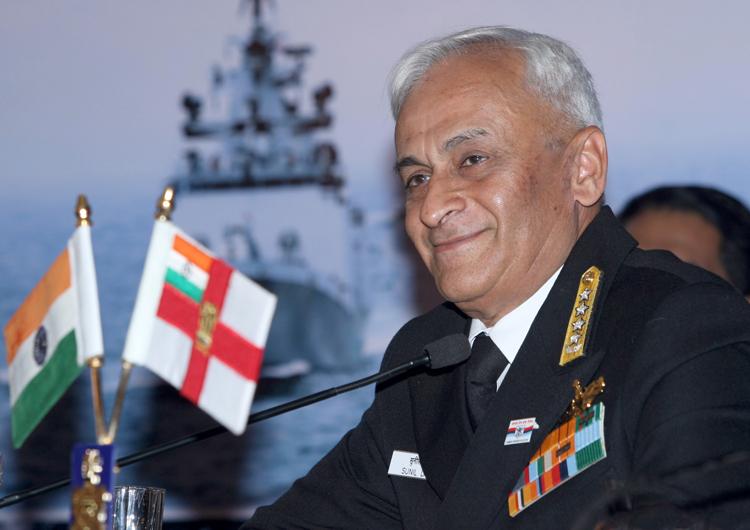 I intend to provide you with a broad overview of the Indian Navy's major operational activities over the past year. I will then highlight our plans for the future. Thereafter, the house will be open for questions. As we surge ahead in the 21st century, the attention of the entire world is focused on the Indian Ocean Region, where our Navy is increasingly seen as a 'net security provider'. The maritime dimension of India's security and its importance to national development and economic prosperity is well recognised today, and has been articulated at the highest levels by our leadership. Accordingly, our maritime security strategy is aimed at providing a maritime environment that is free from all forms of traditional and non-traditional threats to our national development. You are aware that the Indian Navy has successfully completed the first deterrence patrol of INS Arihant this year. With this, we have operationalised the third and the most survivable segment of the country's nuclear triad. Last year we had undertaken a major review of our operational deployment philosophy and based on the prevalent security threats and challenges, we had recalibrated towards 'Mission Based Deployments' in our areas of maritime interests. What we have been able to operationally achieve across this wide canvas of maritime theatre has been largely due to the combat skills honed during major exercises. This year, the Navy exercised its composite combat capability through an array of theatre-level exercises, both on the Western as well as Eastern seaboards. In addition, we also conducted a theatre-level Operational level war gaming exercise titled SHIKSHA-18 which also included proving of joint concepts with Indian Army and Air Force. Exercises like these allow us to refine the Navy's war plans, address Op Logistics issues and integrate the three Services in conduct of large-scale Joint Operations across multiple theatres. As part of TROPEX, we would also be conducting a large-scale coastal defence exercise 'Exercise Sea Vigil' which will involve all stakeholders across mainland and island territories. We aim to test the robustness of our entire coastal security apparatus through his massive exercise. In our quest for stable and tranquil maritime boundaries and to enhance interoperability as well as develop a common understanding of the region's security challenges, we actively participate in numerous regional maritime exercises with our partner nations. This year, the tempo of our overseas deployments and maritime exercises has been at an all-time high. 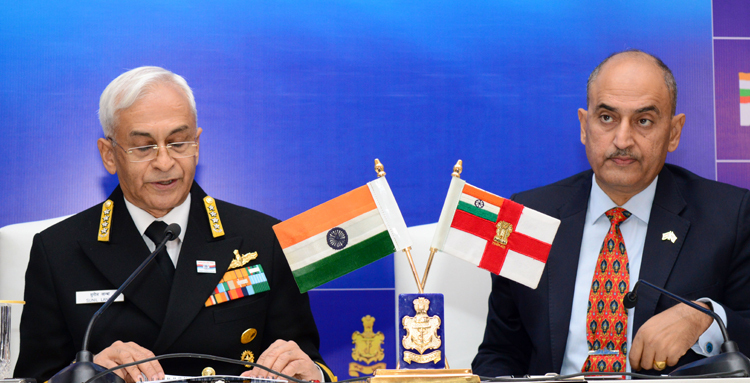 Under the Government of India's overall rubric of 'Neighbourhood First' policy, the Indian Navy also undertook Joint EEZ patrols of Maldives, Seychelles and Mauritius, as well as Coordinated Patrols (CORPATs) with Myanmar, Thailand and Indonesia. These activities help enhance interoperability and ensure security in our maritime neighbourhood as well as in the 'Global Commons'. 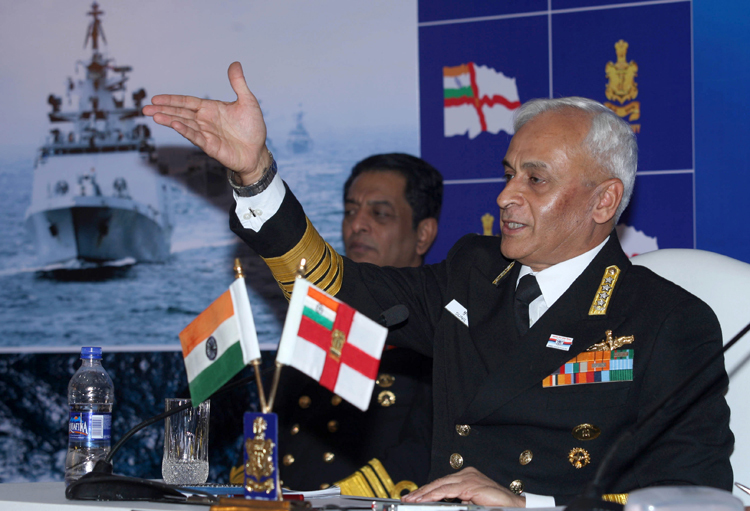 I am pleased to share with you that the Indian Navy's initiatives such as the Indian Ocean Naval Symposium – IONS; MILAN – the biennial gathering of regional navies at Port Blair and Goa Maritime Conclave, have enabled constructive dialogue amongst navies of the Indian Ocean Region. 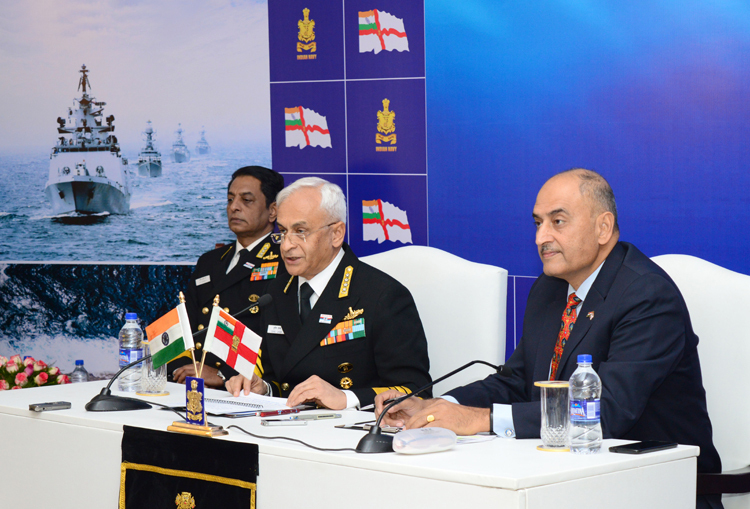 This year also marks 10 years of IONS and to mark this event, the Indian Navy recently hosted commemorative events in last month at Kochi, that included a seminar with the theme 'IONS as a catalyst for Security and Growth for all in the Region (SAGAR)' and a Tall Ship Sail Together from Kochi to Muscat, alongwith Sea Riders from several IONS member states. Information sharing among countries to enhance maritime domain awareness at the regional level has been accorded renewed impetus at the highest levels. We have signed White Shipping Information Exchange agreements with nineteen countries and operationalised them with twelve countries. 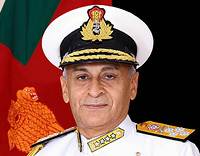 The Information Management and Analysis Centre (IMAC) of the Indian Navy has also emerged as a virtual information hub for White Shipping Information in the region. We are also in the process of setting-up an Information Fusion Centre (IFC-IOR) to further our commitment towards achieving collective maritime security in the IOR. Inductions of new assets and capabilities are being progressed in consonance with the Indian Navy's long-term perspective plans. Before I come to the specifics of the projects, I will briefly update you on our thrust towards supporting the 'Make-in-India' vision. Further, more than two-third of the Navy's modernisation budget has been spent on indigenous procurement in the last four financial years. Indian Navy has also been at the forefront of 'Self Reliance in Defence Production', right since Independence. As I speak today, 32 ships and submarines are presently under construction in Indian shipyards. These include the Aircraft Carrier, Vikrant, P-15B Class Destroyers, P17A class stealth Frigates, P28 ASW Corvettes, Offshore Patrol Vessels and Scorpene class submarines. In addition, Govt approval has also been accorded for 56 Ships and six submarines. The Indigenous Aircraft Carrier is presently in its third and final Phase of construction at Kochi. The Sea trials for the ship are expected to commence mid 2020 and we are closely working with all stakeholders to achieve the delivery timelines. Induction of Vikrant will provide significant fillip to the Navy's blue water capability, increasing the reach and impact of Carrier borne strike forces, both as a means of deterrence as well as during combat operations. The Carrier's substantial integral air power with rapid mobility would be a force multiplier giving India enhanced combat power to protect its maritime interests and Sea Lines of Communication. To achieve this, we should have the capability of operating two Carrier Battle Groups round the year. The case for the second Indigenous Aircraft Carrier has received the necessary impetus. Though it is atleast a decade away, the Aircraft Carrier project would accrue signficant national gains in terms of boosting indigenisation and the country's economy, through its life cycle of construction, maintenance and upgradation. 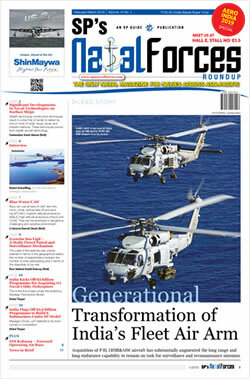 On the aviation front, a long standing critical shortfall in the naval helicopter fleet has been finally addressed with the accord of AoN for 111 Utility Helicopters in August this year And issue of LOR (Letter of Request) for 24 Multi Role Helicopters last month. We are working at timely realisation of these projects. Ladies and gentlemen, while our focus remains on Induction of new technology and state-of-the-art platforms, the Indian Navy truly believes that professional skill and motivation of our personnel forms the heart and soul of our naval capability. Our well-trained, highly motivated and deeply committed human capital will always remain our greatest asset. We are constantly at work to keep our HR polices in sync with the nations' aspirations and expectations. Training, remains one of the Navy's key focus areas. Here, I would like to share with you, that in addition to the wide spectrum of specialist training undertaken in-house at our world-class training institutes, we are also a favoured destination for many of our friendly foreign countries. Based on requests being received, we have increased the number of training vacancies for foreign trainees over the past few years from 699 to 1056. We have also taken the lead as regards Joint Training recommendations of the Shekatkar Committee. The recent commencement of training for 68 Indian Air Force personnel on catering at INS Hamla as the Joint Service Training Insitution (JSTI), marks yet another important step in the Navy's endeavour to strengthen jointmanship as also re-balance defence expenditure through optimally harnessing the existing base of training resources. Ladies and Gentlemen, in keeping with this year's Navy Week theme which is 'Mission Deployed and Combat Ready', I would like to assure the nation that the Indian Navy continues to remain 'on watch' 24 X 7 safeguarding our national interests in the maritime domain.